Our new ‘Food to Go’, a sustainable and delicious ‘grab and go’ food concept is proving to be a big hit with customers. The ‘Food to Go’, range of sandwiches, wraps, salads, snacks and desserts have been developed to provide a fresh and nutritious alternative to high street options whilst reducing the impact of lunchtime packaging waste. 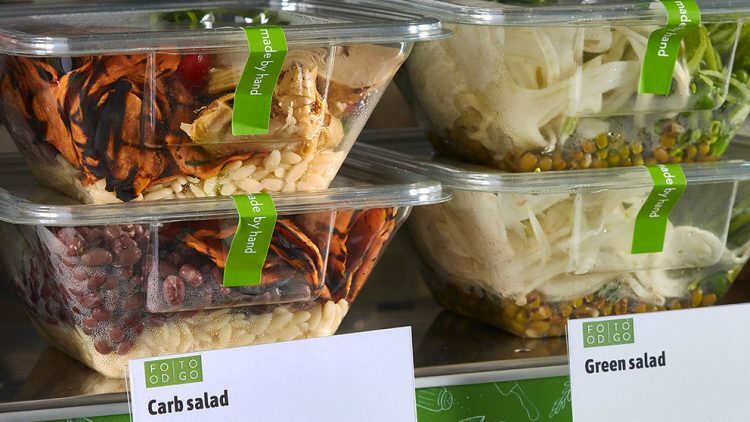 Demand for quick and convenient lunches is growing with grab and go sales increasing by seven per cent in the UK last year. It is now worth £20billion and makes up 70 per cent of all lunchtime choices. We have developed bespoke packaging that uses 100% recyclable plastics and cardboard, in addition to the sandwich packaging film that can be composted within 12 weeks. More than 100 delicious recipes have been created for the range and they are all made fresh at our locations every day. The development chefs have devised a tempting range that includes buckwheat, edamame beans, baby spinach and sweet potato with tomato and cucumber salad, beetroot, almond and cranberry bircher muesli and linseed roasted salmon with free range egg, courgette and baba ganoush wholemeal wrap. The ‘Food to Go’ selection will be refreshed quarterly to include seasonal ingredients and to keep pace with food trends. The range includes vegetarian, vegan and gluten and dairy-free options with identifying icons for customers. Nutritional information is displayed on labels and every item is listed on My Fitness Pal – appealing to diet conscious consumers. The concept was trialed at a client site in Canary Wharf and benchmarked against high-street equivalent products. Around 5,000 people were surveyed during the trial with customers able to provide feedback on the range.